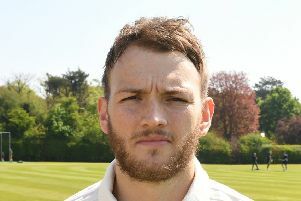 Woodhall Spa’s 17-year-old Jack Timby scored a maiden Lincs ECB Premier League century in his side’s losing draw at home to high flyers Bracebridge Heath on Saturday. The wicket-keeper and opening batsman scored exactly 100 from 146 balls as his side finished on 209-7, chasing a formidable 300 for victory. The right hander batted for almost three hours and showed his skill against both pace and spin bowlers before losing his wicket in search of extra runs for extra team bonus points. Having missed out on a century earlier in the season, his 100 was greeted with rapturous applause from his team-mates and a swelling 1940s-style crowd at Jubilee Park on Saturday afternoon. Earlier in the innings, he had shared in a blistering opening stand of 58 with his skipper Jack Luffman (26) and another 60 run stand for the sixth wicket with Ross Dixon (29) as the home side eventually ran out of steam in the chase to haul down their visitors’ 299-7. After winning the toss Luffman inserted Bracebridge and reaped immediate reward as Jean-Pierre Prinsloo clean bowled the visiting captain, Nick John, with the very first ball of the match. However, for the remaining 99.5 overs of the game it has to be said that bat dominated ball on a wicket that was flat, hard and fast, and an outfield that was equally as quick. Despite the huge score, the Spa bowlers and fielders stuck to their task excellently and on another day and with some luck the score could quite of easily been less. Prinsloo bowled well up front and on his return to the attack in the death overs claimed 3-56, while 14-year-old Alfie Lindsey continued to impress with his new ball bowling and was unlucky not to claim a wicket. Club coach Paul Timby bowled 17 tight overs and the home side looked to cut down boundary opportunities. It was a hard fought eight points for the home side with a performance that probably deserved more. Away at Billingborough, Spa’s 2nd XI had a day to forget, unfortunately. Having been asked to bat first, they were dismissed for just 68 in 21 overs. Connor Parsons (11), James Harris (12) and Matt Haslam (11 not out) were the only batsmen to reach double figures. In reply, the home side lost four wickets, with Parsons and Haslam claiming two apiece. On Sunday, the Wanderers 2nd XI moved into a solid second spot in Lincoln League Division Two with a six wicket win at Old Lincolnians. Bowling first, Spa dismissed the home side for just 120 inside 32 overs. Pick of the Spa bowlers were off-spinner Henry Wilson (4-16) and James Harris (3-22). John Temperton also picked up two deserved wickets. In reply, Jean-Pierre Prinsloo anchored the run chase with a solid and fine 61 not out, his first half-century at senior level. He was well supported by Alex Hodson (8), Adam Barker (22) and Harris (8 not out).